Spiked clothes are, of course, ideal for creating a punk rock or Halloween look, and in this post I'm going to show you some great ideas for creating your own punk style costume. Some of these items can also be worn for everyday casual wear, although some (like the costume below) obviously can't! This corset and skirt is absolutely ideal for creating a punk look and available in sizes 10/12 and 14. Because it isn't real leather it's available at a very reasonable price - perfect for fancy dress. Actually, faux leather is lighter and easier to wear than real leather and, of course, no animals have been killed to make it. 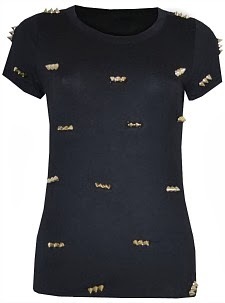 If you're not comfortable with weraing the corset and skirt, then how about this spiked T-shirt for ladies? It's available in three colours; black, khaki and red wine and in sizes 8-14. This stylish spiked bra is available in gold or silver colours and available in sizes 34 to 38. It's one of the best-value options, but there are many others available - Spiked Bras. 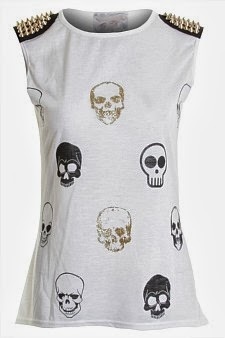 I just love this design which is perfect for wearing as part of a punk, rock or Halloween costume. This vest top is available for sizes 8 to 14 and priced at a very reasonable £8.99 to £9.99. 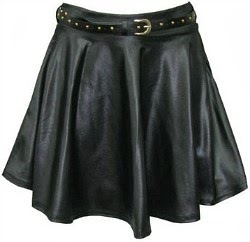 This high-waist skirt has leather-look fabric and includes a studded belt. As I write, it has 40% off the rrp which will hopefully still be the case when you're reading this! The skirt is available in sizes 6 to 14 and it matches very well with that skull print top don't you think? This Metallic Silver Spiked Bracelet £4.88 is mounted on stretchy elastic for an easy fit and would make for an ideal accessory for your punk rocker costume. 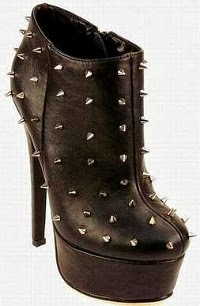 These faux leather, platform style spiked boots with a stiletto heel are available in sizes 3-8 and are ideal not only for gothic and punk dress-up, but could also be worn casually when the party's over. 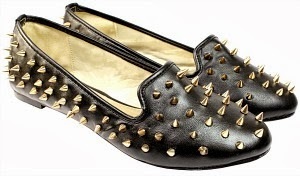 If you're not comfortable in anything with a high heel, then these flatter-style shoes may be more to your liking. They're available in UK sizes 3-7. Of course, they're not as authentic-looking as boots for a punk look, but they're a damn sight more comfortable and can be worn casually. You may also want check out the Tartan Punk Costumes post on this blog.